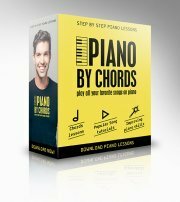 As you precede with these beginner piano lessons you'll understand better how music works and that's a cruical part for those who who are learning to play the piano. It's a free ticket to making better music since you'll understand the logic behind what you're playing. I finally understood why they were so IMPORTANT!"